See no volcano? That’s because more than a mile of water covers the top of the mammoth mound of rock. The solar system’s biggest known volcano, Olympus Mons, towers 20 kilometers above the surface of Mars. The second biggest is an Earthly giant, new research shows. This Tamu Massif is currently sleeping with the fishes some 2 kilometers (1.2 miles) below the surface of the Pacific Ocean. Until recently, volcanologists — volcano scientists — had assumed Tamu Massif consisted of several volcanoes squished together. And if that were true, “nobody would have paid it much attention,” says William Sager. This geophysicist works at the University of Houston in Texas. “What’s really special is that it is one big volcanic mountain,” he says. Sager and his coworkers reported the data showing this Sept. 8 in Nature Geoscience. A massif, which comes from the French word for massive, is a portion of Earth’s crust that is indeed massive, dense and rigid. The term often applies to one or more mountains that are independent of the rest of the range in which they reside. In the middle 1990s, Sager and a coworker named this ginormous underwater massif for the university at which they were then working: Texas A&M University, or TAMU. The volcano resembles an overturned bowl. But covering roughly 30,000 square kilometers (11,580 square miles), its footprint exceeds the size of Massachusetts. This mound gently rises into a hump that sits 30 kilometers (18.6 miles) above its base. 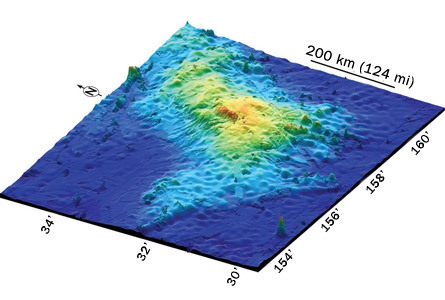 Yet only about 3 kilometers of its bulk is visible above the ocean floor; the rest is wedged deep within Earth’s crust. That’s in stark contrast to Olympus Mons. The Martian volcano sits atop a thick, rigid skin of rock. That skin supports the mountain much like a dish of Greek yogurt would support an ice cube, Sager says. The cube may settle lightly into the yogurt; it wouldn’t sink far down. But put that ice into a glass of water, and all but a small portion of the cube will float below the surface. That sort of describes Tamu Massif, Sager says. The portion of Earth’s crust where the volcano sits can’t support most of the weight of this dense mass of rock. That’s why most of the mountain resides below the ocean floor. So despite its deceptively small height above the seafloor, this behemoth encompasses a volume of rock only about 20 percent smaller than Olympus Mons. Scientists have known for roughly a century about the mountain range in which Tamu Massif sits. But it never got much attention. And it’s easy to see why. Visiting requires a four-day cruise from Japan or a 10-day trip from Hawaii to a part of the northwest Pacific that Sager describes as “basically in the middle of nowhere.” And then test equipment has to plunge down, down, down through the water. What the monitoring equipment would encounter is a roughly 145 million-year-old mega-mound. It’s about 50 times the size of Hawaii’s famed Mauna Loa, notes Sager. Tamu Massif lacks the characteristic sharp cone of volcanoes like Oregon’s Mount Hood or Japan’s Mount Fuji. Instead, the rocky flanks of the hiding mammoth rise only gently from the seafloor. During a series of long cruises between 2010 and 2012, Sager and his coworkers probed this mountain with sound waves and drill bits. Their data now show a single, mammoth volcano that had periodically erupted during a short, million-year growth spurt. Some of the eruptions deposited immense sheets of lava up to 22.9 meters (75 feet) thick. These spewed out and down in all directions from a central vent atop the mound. The lava traveled long distances, flowingalmost like thick pancake batter. What made this possible, Sager suspects, was the ocean’s quick cooling of the lava’s topmost layer. A skin would have developed, creating a thin blanket of rock. Protected by this insulating blanket, most of the lava would remain piping hot and mobile for a long time. So instead of creating a sharply peaked cone, like Mt. Fuji, this volcano created a slowly rising mound, one that over time grew to enormous size. Drilling data show that Tamu Massif emerged at the edge of two tectonic plates. Think of the region, Sager says, “as a crack that forms where you pull two plates apart.” Suddenly, magma would have emerged from this so-called spreading center. Not all volcanoes form this way. Those on Hawaii’s Big Island formed in the middle of a tectonic plate, for instance. “We had thought it was plausible that Tamu Massif was an island at one time,” the scientist says. But that no longer seems likely. While drilling into this underwater mountain, the geologists ran into layers of sediment that were only a few hundred meters thick. That sediment resembled what forms in shallow water. Yet the mountain’s surface showed no erosion that would be typical of volcanoes that spend time above the ground or water’s surface. crust (in geology) The outer, rocky skin of a planet, such as Earth. geophysics The field of study that describes how Earth and other planetlike objects form and the energetic processes by which their structure changes over time. Meteorology, oceanography and seismology describe aspects of the processes that govern those changes to Earth and its environment. lava Molten rock that comes up from the mantle, through Earth’s crust and out of a volcano. magma The molten rock that resides under Earth’s crust. When it erupts from a volcano, this material is referred to as lava. mantle (in geology) Earth’s middle layer, right below the crust. massif (in geology) Part of a mountain or mountain range that is independent of the neighboring rock. volcanism The processes by which volcanoes form and change over time. Scientists who study this are known as volcanologists. volcano A place on Earth’s crust that opens, allowing magma and gases to spew out from the mantle. The magma rises through a system of pipes or channels, sometimes spending time in chambers where it bubbles with gas and undergoes chemical transformations. This plumbing system can become more complex over time. This can result in a change, over time, to the chemical composition of the lava as well. The surface around a volcano’s opening can grow into a mound or cone shape as successive eruptions send more lava onto the surface, where it cools into hard rock. C. Gramling. “A volcano’s deadly ash.” Science News for Kids. March 10, 2006. K. Kowalski. “How Earth’s surface morphs.” Science News for Kids. Aug. 7, 2013. S. Ornes. “Warm lava on a hot planet.” Science News for Kids. Nov. 8, 2010. K. Ramsayer. “A volcano wakes up.” Science News for Kids. Dec. 12, 2004.